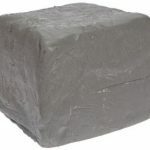 All moist clays are de-aired, packed in 25# bags, with two bags per box. We quote on custom clay bodies, both moist and dry, with a minimum order of 1,000 lbs. Clays available in dry form, 1000 lb minimum, call for pricing.